Brian W. Breed, Elizabeth Keitel et Rex Wallace (éd. ), Lucilius and Satire in Second-Century BC Rome, Cambridge, 2018. 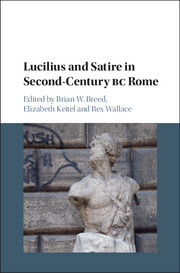 This volume considers linguistic, cultural, and literary trends that fed into the creation of Roman satire in second-century BC Rome. Combining approaches drawn from linguistics, Roman history, and Latin literature, the chapters share a common purpose of attempting to assess how Lucilius' satires functioned in the social environment in which they were created and originally read. Particular areas of focus include audiences for satire, the mixing of varieties of Latin in the satires, and relationships with other second-century genres, including comedy, epic, and oratory. Lucilius' satires emerged at a time when Rome's new status as an imperial power and its absorption of influences from the Greek world were shaping Roman identity. With this in mind the book provides new perspectives on the foundational identification of satire with what it means to be Roman and satire's unique status as 'wholly ours' tota nostra among Latin literary genres. 11. Invective, virtus, and amicitia Luca Grillo.